MetaTrader 4 is a popular trading platform which allows to realize trading operations and technical analysis while trading various financial instruments in Forex and CFD markets. Currently, IFC Markets does not provide MetaTrader 4 trading platform for Mac OS X, however, our clients can temporarily use the following option for the installation of MT 4 for Mac OS. 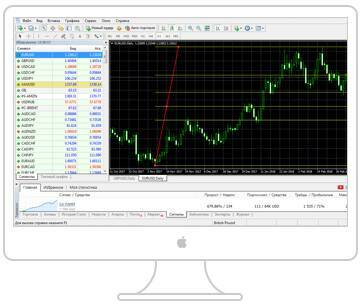 The client terminal MetaTrader 4 for Mac OS can be installed and used on computers running Mac OS operating system through an open source program PlayOnMac. PlayOnMac is a free and an easy-to-use software which allows installing Windows applications on Mac OS without any difficulty. PlayOnMac is based on Wine which is not an absolutely stable product. This means that the functions of the application may crash and not work properly. To avoid problems we advise to use MetaTrader 4 platform for iPad and iPhone.